- Dig your hands into potting soil and replant your houseplants! Brightly painted glazed pots will wipe away winter doldrums. - Plan out your garden Maybe set aside a section for something new! Try a Bee garden to help pollinate those beautiful flowers that enhance your yard. There are so many different types of gardens. such as a fragrant garden,herb, butterfly. - Order now your seeds and plant trays. There is always something new! - If the weather breaks a little, go out to the shed and pull out the tools to make sure they are in working order. Sharpen the pruners and clean off shovels and rakes. - Don't forget our feathered friends and feed them, especially now with the brutal cold and snow covered land. Not sure if I should build an ark or strap a fan on my back! Rain or heat both can reek havoc in the garden and can be equally as bad. Let's start with rain and the excess water. Unfortunately your container pots fill and the potting soil that you lovingly wrapped around those beautiful annuals are spilling out by the gallon! Spill any excess rain water off and let dry for a day or two then amend the soil with some fertilizer as a lot of nutrients got washed away. Any standing water should be spilled as it can be the perfect breeding ground for mosquitoes. Weeds seem to grow twice as fast after a good rain, don't they? The ones that you can reach, pull because it so much easier when the soil is wet. But the interior weeds you should wait a day or two. Reasoning is that the when you step into your garden since the ground is spongy, your shrub and plant roots are vulnerable to being crushed and compacting the soil as you step down. Too much sun on your plants is like you getting sunburn. As you have tissue and cells so do your plants. Make a shade area for your vegetables made from sheeting and wood stakes. When you get weather that will be constant full sun and no clouds for days you will want to protect them. Make the stakes at least 4-6 inches higher than your plants so that the bees can still pollinate the flowers. Hydrate your plants in the early AM. Give them long drinks of water making sure that the water has saturated the soil and root. When you see the water run out right away means that the soil was dry and not holding the water. Go back in few minutes to make sure it has saturated. Watering in the late evening may promote mildew. Watering in the AM will insure the plants well being with the sun evaporating excess water sitting on it's leaves and stems. Mulch your garden. It will not only help keep the weeds down but also protect the plants roots by insulating them with moisture. So when you water the paper will absorb the water. There are several methods for vegetable gardens. The one that I like is strips of newspaper and straw, Will the newspaper print harm vegetables?Most inks these days are soy based so you will be fine. Stay away from the glossy mag stuff tho. Grass clippings also would be fine. A good thick layer around each plant. Holds moisture and add a bit of nitrogen. Hope these tips will help and see you next month! The weather is starting to get warmer and it's great to get outside and get things done. That being said, we're off to Mays to do list. Get the lawn mower prepped by having it serviced for a tune-up. Did you finish planting your summer bulbs? Get them in the ground now before it gets too warm. Make it difficult for critters getting to the bulbs by throwing gravel on top. They dislike digging into things that are sharp. Now is the time to fertilize fertilize fertilize!! Your rose plants need a 10-10-10 fertilizer, BUT only after their first bloom than repeat every 4-6 weeks. All of your flowering and fruit bearing trees need a higher phosphorous fertilizer 10-60-10 that will give you more flowers later on. The spring flowering shrubs like rhododendrons need acid based fertilizer. Now is the time to plant your herbs, basil chives. sage and thyme. Map out where your annuals will go. Make sure that you are clear of any frost nights. Growing up in the northeast we always waited till Mother's day when we knew for sure that we were out of danger. 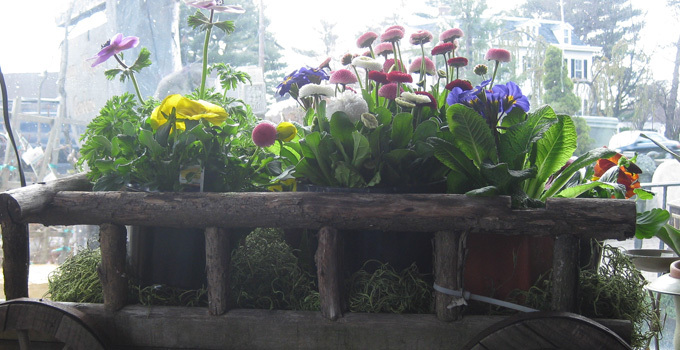 Pinch back your annuals when they go beyond 4-6 inches. Will make them fuller. Your trees and shrubs are thirsty after a long winter, water deeply and infrequently, The roots run deep and wide and it takes time for the water to spread and go down deep. If you do short spurts you are only watering the surface soil. Wasting water and your time. Invest in a soaker hose and timer. If you have a deck, check for loose nails repair. Air out the patio cushions, umbrellas. Mend the screen doors now before you really need them. See you next month until then enjoy Spring! Something new at Denny Wiggers! A monthly checklist to go through. Some things you probably already do and maybe there will something new that you had not thought of! Rake all around and in between your shrubs. Last years autumn leaves have gotten caught in the branches. Tidy around steps and all along the fence line. After your spring flowering bulbs have flowered and died, let them wither and turn brown completely! The food that was stored in the leaves and stems go back into the bulb for next years bloom. Fertilize your lawn. There are a lot of different commercial blends out there to choose from. Do you have a fireplace and only burn hardwoods? Burned firewood (wood ash) contain twenty-five percent calcium carbonate. (liming material) Because wood ash is extra fine, the material will saturate into the grass easily. Do not over do, wood ash is extremely alkaline and too much of a good thing can do more harm than help. Have a beer! (for the slugs) pour into shallow dish near your newly planted shrubs. The next day throw out drunken dead slugs. Plant your summer loving bulbs now for beautiful color in a few months! Check your rose bushes. Look for black spots and mildew. Remove any leaves that have any spots and wash away mildew with a good rose wash.
Rake in rich organic topsoil in your shrubs and around the trees. Top off with 2-3 inches of mulch to give your landscape a finished look and to protect the roots against summers heat. Let's get out there and enjoy the fresh air and breath deep! See you next month!